Since moving back to Pretoria from my beloved Cape Town, I have been silently mourning the lack of freely available gluten-free fare. In fact, most restaurants seem to think you are swearing at them when you enquire about the gluten-free status of menu items. As fate would have it, I could've heard the heavens open up to hear old Will S. singing: "Sigh no more, lad(y), sigh no more...And be you blithe and bonny, converting all your sounds of woe into, 'Hey, nonny, nonny'", on the happy day I perchance stumbled across the website for Fresh Earth. 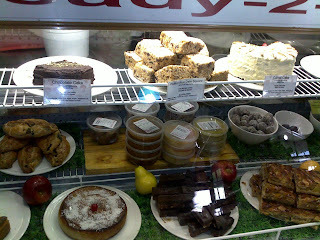 Situated in Komatie Road, Emmarentia; this health food store/bakery/eatery is a coeliac sufferer's dream come true. All suitable menu items are coded (gf) to offer peace of mind when ordering, and bakery items are labelled with a full list of ingredients when perusing the display cabinet. 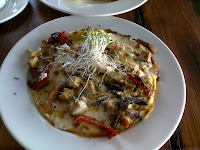 Oven baked omelette filled with pesto roasted vegeatbles, saute tofu, goats feta and mozarella cheese. This was delicately flavoured with a good balance of toppings. 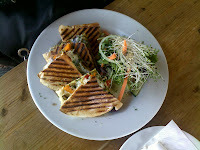 Vegetables were roasted to perfection, while the amount and varieties of cheeses used were not overpowering. 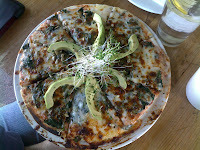 Spinach, avocado and mozarella cheese (on a gluten-free base). Base was crisp (a bit too crisp in places). Topping was, according to my hubby, "Simple yet tasty." 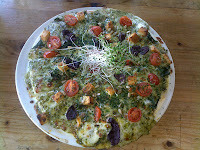 Basil pesto, spinach, olives, Italian tofu, tomatoes, oregano and mozarella cheese (on a gluten-free base). This topping managed to amalgamate a profusion of tastes, with none being singularly over-reaching. The basil pesto was sufficiently bouyant to make its presence known, while the Italian tofu was a little taste of vegan yum. While I can't vouch for the taste, my mom did take her leftover pita slices home with her, which is a testament of its own I suspect. 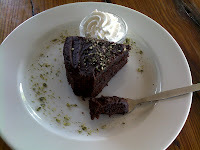 Ah, the cake...my favourite part :-) Moist and dense without being overly sweet. The cocoa is what comes through here, which is exactly what a fan of 70%+ dark chocolate Lindt is wild about. Big thumbs up. The Carrot Cake (gf) was also exceptionally good. We bought this as a take home version at R45 for a decent sized log cake. Ingredients are listed as: Rice flour; pineapple; carrots; oil; sugar; eggs; pecan nuts; cream cheese and spices. The topping adds a subdued lemon zesty zing, which balances out the sweetness of this extremely moist cake to perfection. Since price and value-for-money are relative concepts, I can only offer that for two people (breakfast x 2, beverages x 3 rounds, cake x 2), the outing came to R240, while for three people (breakfast x 3, beverages x 2 rounds, cake x 3), the total was R340. Make of that what you will. 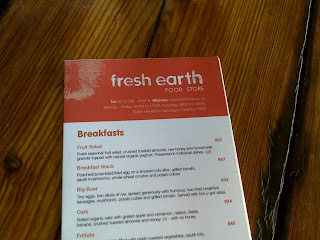 A full menu with prices is available on the Fresh Earth website. As with any production, the stage plays a part in making a lasting impression. 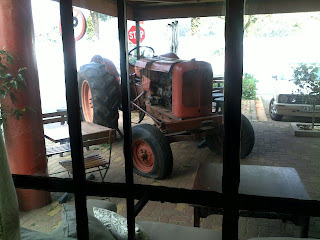 The outdoor setting is lovely, with wooden tables under an awning, flanked by wheat grass and a red tractor (which seems to give most kids something to happily clamber about on, while having the odd side-effect of making my IT-ish husband want to refurbish old VW combis). 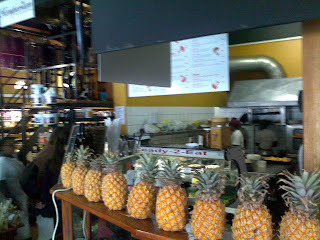 The interior shop is well-stocked and lends itself to the element of 'browsiness', which I like. In an otherwise stellar review, I have only two minor gripes. One, the bathroom arrangements are cramped, noisy due to the extractor fan, malodorous due to the trash cans and somewhat lacking in privacy should someone look out of their windows in the surrounding block of flats. Two, the indoor seating area. This space is cramped and lacks a good supply of fresh air, which isn't helped by the patroness using this area as a space for a rather loud Saturday morning business meeting at the adjoining table. That's it, end of complaints. In summary, was the food good? Yes. Was the service good? Yes. Was the setting good? Mostly - outside is lovely. Would I go there again? A resounding, yes!